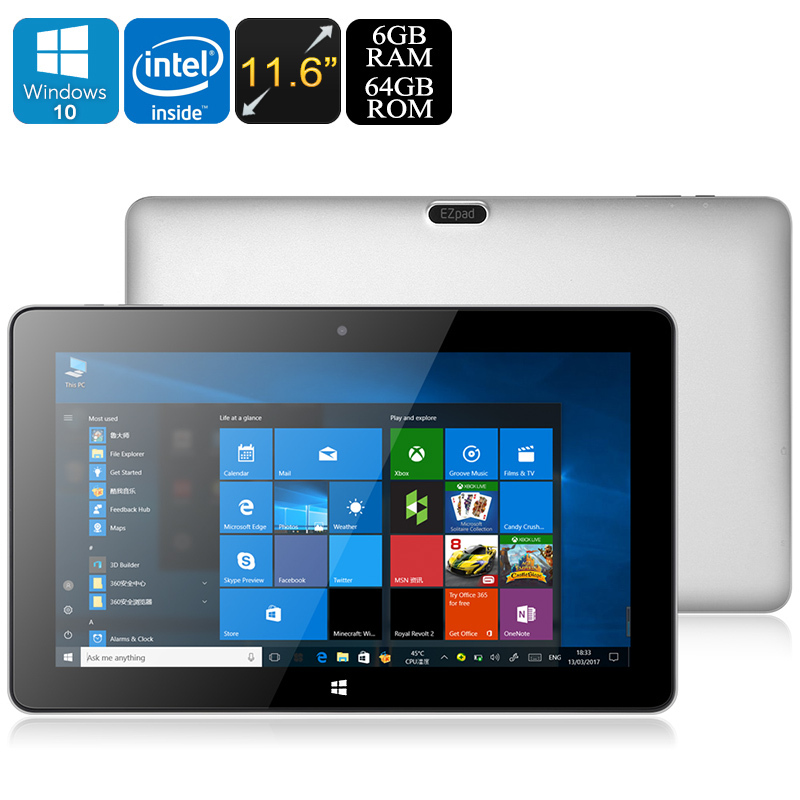 Successfully Added Jumper EZpad 6 Pro Tablet PC - Windows 10, Apollo Lake CPU, 6GB DDR3L RAM, 11.6-Inch Display, 1080p, 9000mAh, OTG to your Shopping Cart. The Jumper EZpad 6 Pro is a powerful 2-in-1Windows Tablet PC that allows you to make use of the latest Windows features anywhere you go. The tablet computer has an extremely sleek design that gives it a high-end look and feel. This Windows 10 Tablet PC certainly is an eye catcher. What sets this tablet apart from its competition is that it comes with a magnetic keyboard connection port. Thanks to this, you’ll be able to attach it to an external keyboard (not included) and turn it into a full-blown 11.6-Inch laptop. This brings along great efficiency for all of you that wish to write up e-mails, documents, or simply work on the go. This sleek Windows 10 tablet computer is perfect for both business and entertainment purposes alike. The Jumper EZpad 6 Pro Tablet PC comes with a Windows 10 operating system. This is guaranteed to bring along a smooth user experience that lets you enjoy all the latest Windows and Office features. Your tablet computer furthermore treats you with 64GB eMMC internal storage and the possibility to slide in a 128GB SD card slot. Thanks to this, your tablet computer comes with plenty of memory for you to store your files, media, and latest downloads. From now on, you’ll always be able to carry along all your files anywhere you go. With this Windows tablet PC at your side, you’ll never have to worry about running out of storage. Within its beautifully designed body, this Windows 10 tablet holds some powerful hardware. It comes packed with the Intel Apollo Lake N3450 processor. This Quad-Core CPU is capable of reaching clock speeds of up to 2.2GHz. Along with its state of the art chipset comes a massive 6GB DDR3L RAM. Together, this allows you to enjoy the latest and most demanding software without dropping a frame. Whether you’re into games, movies, or simply use it for business purposes – the EZpad 6 Pro handles it all. Thanks to its 9000mAh battery, you’ll be able to enjoy all it has to offer for hours in a row. This two-in-one tablet PC has a stunning 11.6 Inch display. On this screen, your tablet portraits all your media in breathtaking 1080p resolution. It furthermore supports IPS technology that lets you enjoy vivid color and sharp details no matter your viewing angle. Thanks to its stunning display, this Windows 10 tablet PC is perfect to meet your mobile media demands. With this Tablet computer at your side, you’ll always be able to enjoy a truly stunning visual experience no matter where you’re at. Additionally, its mini HDMI port allows you to hook it up to an external display to enjoy all your media and games even further. The Jumper EZpad 6 Pro comes with a 12 months warranty, brought to you by the leader in electronic devices as well as wholesale electronic gadgets..